This month’s update is all about our continued commitment to listen to all of you and transform the Xbox experience based on your feedback. Today, we’re excited to announce a few features that you’ve been asking for which are coming to Xbox One, the Xbox app, or both. The host of updates include top-voted Xbox Feedback requests such as the ability to purchase Xbox 360 Backward Compatible games on Xbox One and improving social features like Party Chat broadcasting to Twitch. The updates will begin to rollout to the Xbox One Preview audience starting today and to Xbox app (beta) members starting tomorrow. Purchase Xbox 360 Backward Compatible games on Xbox One: Fans have spent more than 30 million hours playing Xbox 360 games on Xbox One and so it’s natural that being able to purchase Xbox 360 Backward Compatible games on Xbox One ranks as one of your top requests. With this update, you’ll be able to do so! Find and purchase Xbox 360 Backward Compatible games the same way you would Xbox One titles and, once purchased, Xbox 360 Backward Compatible content will automatically download to your Xbox One and be ready to play! Include Party Chat in Twitch broadcasts: A top voted-for feature on Xbox Feedback, Xbox One Preview members will be able to broadcast Party Chat when using the Twitch app. If you are broadcasting from your console and in a party, you can invite other people to include their chat audio in your broadcast. If a member of your party declines, they’ll still be able to chat in the party; they just won’t be heard in the broadcast. Additionally, as the party leader, you have the option to mute a party member’s chat audio, even if they opted-in. You can also include party members on Windows 10 PCs in your Twitch broadcast. Output your Party Chat to headset and speakers simultaneously: Xbox One Preview members will be able to select their preference for where Party Chat audio is heard: their headset, speakers, or both. To do this, go to Settings – Display & Sounds – Volume. Customizable Game DVR recording length: Based on Xbox Feedback, it’s clear that fans want to be able to configure the length of their Game DVR recordings. Currently, Game DVR recording is fixed to a 30 second duration. With this update, Xbox One Preview members can adjust the recording length to 15 seconds, 30 seconds, 45 seconds, 1 minute, 3 minutes or 5 minutes. To change the preferences, visit Settings – Preferences – Game DVR & streaming. Track Achievement progress in the Xbox One guide: We’re making it easier to access your Achievements by including them in the Xbox One guide. In the new Achievements area you’ll find a quick link to see all of your Achievements and you’ll be able to track your Achievement progress in real time directly in the guide, without having to snap a separate Achievements app. Video playback directly in the Xbox One Activity Feed: We’ve made improvements to video playback in the Xbox One Activity Feed. Xbox One Preview members will be able to play an entire video inline rather than having to leave their feed to launch it. You can even ‘like’ the video while previewing it by pressing X. Preview members will also enjoy new pause, restart, and full-screen playback options, when they do choose to launch a video from their Activity Feed. Gamerscore Leaderboard: In the Xbox app (beta), fans will be able to enjoy the same Gamerscore Leaderboard feature introduced to Xbox One last month. Access the Gamerscore Leaderboard in the Xbox app (beta) by navigating to the Achievements section of your profile. See where you stand relative to your friends by comparing total Gamerscore, as well as the biggest gains over a rolling 30-day period. 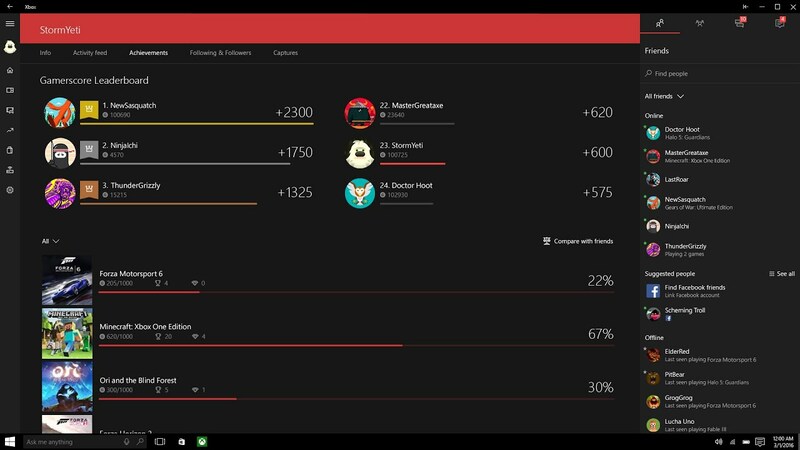 A Leaderboard for game stats will also be coming to the Xbox app (beta). Visit the Game Hub for a title with hero stats, click on Achievements and see how you stack up against your friends. Updated ‘Featured’ section: The ‘Featured’ gaming section below the ‘Recently played’ games area has been updated to spotlight games, deals, community events and more. 16-person Party Chat: Last fall, we expanded Party Chat to enable 12-person Parties on Xbox One and the Xbox app. This feature has been very popular with the community, so now we’re enabling 16-person Parties across both Xbox One Preview and the Xbox app (beta) starting today! Xbox 360 Achievements in Xbox One and Xbox app Activity Feeds: Starting this month for both Xbox One Preview and Xbox app (beta) participants, Xbox 360 Achievements will automatically post to your console and Windows 10 PC Activity Feeds. As with Xbox One game Achievements, the Xbox 360 Achievement graphic will feature a description of the Achievement, the game you earned it from, and the Gamerscore associated with it. Follow web links and YouTube videos from Game Hubs: Community managers of Game Hubs will now be able to populate Game Hubs with web and YouTube hyperlinks, making the Game Hubs experience even more interactive and engaging for gamers. For Xbox One Preview members, web links will display in a browser via the Edge app and YouTube links will open in the YouTube app. For the Xbox app (beta), links will open in your default web browser. As with any other item in your Activity Feed, you can caption, like, comment on, and share these links. Compare your Avatars: In Xbox One Preview shortly and releasing to the Xbox Avatars app later this month, you’ll be able to compare your Avatar with your friends’ Avatars. You can click through on a specific friend’s Avatar; preview their Avatar’s clothing, accessories and props on your Avatar; and also see how you can purchase or earn the items yourself. Using the ‘Compare Avatars’ feature will help you customize your Avatar leveraging the best of all your friends’ outfits! You can also compare your Avatar with anyone else’s in the Xbox Live community – just select ‘Compare Avatars’ when you are viewing another member’s profile. Reputation rating interface changes: The Xbox Live community is comprised overwhelmingly of players with positive reputations, and so, the vast majority of profiles are rated ‘good.’ As a result, we are changing our reputation interface to draw attention only to players who have been rated ‘needs work’ or ‘avoid me’. For Xbox One Preview and Xbox app (beta) members, ‘good’ players’ profiles will no longer feature a reputation gauge, however, gamers whose profiles are tagged ‘needs work’ or ‘avoid me’ will continue to feature the reputation flag. Thank you again for helping us shape the Xbox experience. Please keep voting on Xbox Feedback for features that you want to see added or updated on both Xbox One and the Xbox app!